When your day gets so bogged down in the every day it’s hard to see very far. My farmer and I were both just searching for why this had to happen. I felt disillusioned with mankind, betrayed, and beaten down. I pulled clothes out of drawers to clean to try to process this event. I dug into the Ancient Word searching for truth and meaning. Maybe sometimes there isn’t an answer. Sometimes the understanding of an event may never happen this side of eternity. God’s purpose may simply be to grown us in our understanding of His character. I want to lash out and scream how unfair this is. I want to blame people. I want to wallow in a see of self pity. I can continue to let this bother me and let the outcome affect my life. Or I can surrender and move on. Not only that but I cleared out another bag of stuff. At my lowest point, the kids all arrived home with their friends. They were here to practice music. I walked into this scene. I miss my farm boy so much. Yet look, see his legacy-Here, in this music room? Often, when your heart is broken and you feel at your lowest, God places in our path a glimpse of something more. They pull me out of my self wallowing. They help me to remember. God is working a plan. He’s doing things I can not see. He’s expecting me to do my work and no other. I stay in the moment and enjoy this group of teens. 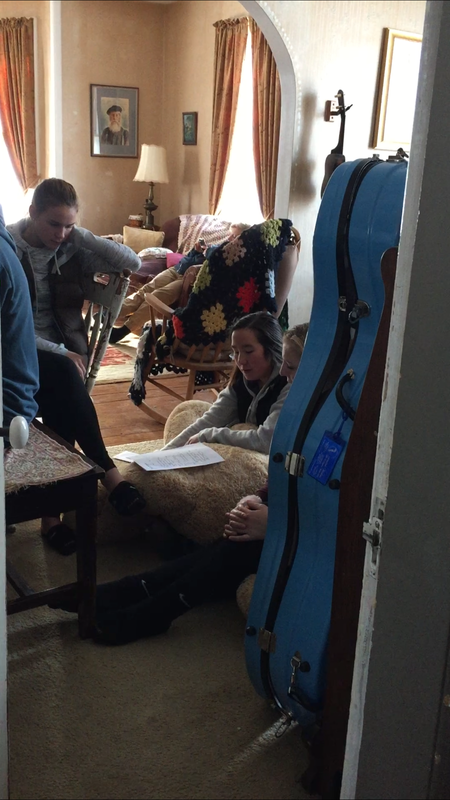 I listen as they arrange music and prepare to share their gifts in a few weeks. I can not control the actions of others. I can only be responsible for my own. I can’t fix this trial, but I will fix my eyes on the One who can. I will rest and trust that even in this God will make a way.